Courtyard Marriott Santa Monica and Hampton Inn & Suites Santa Monica were designed to complement each other. Studio HBA, a division of Hirsch Bedner Associates, is slated to complete two properties in Santa Monica, Calif. Courtyard Marriott Santa Monica and Hampton Inn & Suites Santa Monica were designed to complement each other, with the former said to represent the beach town’s bluffs, while the latter reflects the California waves. Exteriors for both properties were designed by Gwynne Pugh Urban Studio. Both properties will open this September. Courtyard Marriott Santa Monica is located on the corner of 5th and Colorado, with 136 guestrooms with an overarching theme of the earth’s tectonic plates prevalent throughout. Upon completion, the hotel will have edge-lit ceiling, and with custom lighting – created by Illuminate – giving an impression of the earth’s plates radiating from the front desk. There will also be a “cloud-like” light fixture also designed by Illuminate, and a full-height media wall that will provide a dramatic counterpoint. Oversized digital “Polaroids” will be on display, allowing for Route 66 travel imagery to be shown in the lobby area. There will also be a three-dimensional topographic map of Santa Monica to serve as a focal piece behind the front desk, as well as suspended wood planes floating above. Sustainable earth-toned stain will be applied to the concrete slabs on the floor, rather than traditional imported floor tile. The lobby will similarly have casual seating groups with colorful area rugs. Santa Monica-based Illuminate – a lighting consultancy under HBA – created a new lighting scheme for the property, with concealed LED fixtures revealing the building’s rugged architectural exterior. Elevator lobby walls will have local art, silk screened onto glass featuring the Santa Monica 66 “End of the Trail” sign and the Santa Monica Pier. There will be a pool deck and terrace with glowing furniture and fire pits on the second floor. 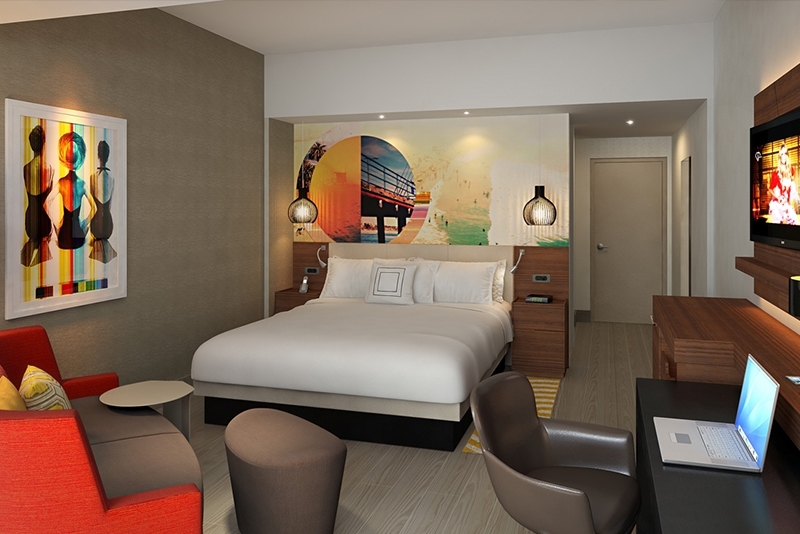 The guestrooms will have a full headboard wall, graphic image of the Santa Monica Pier, abstract art including a graphic depiction of the 1950s-era bathing beauties, and a full wall in the bathroom showing bubbles ascending in water printed on wall covering. Top floor suites in the hotel will have balcony, outdoor seating, fireplaces and built-in bars overlooking the Santa Monica Pier and beyond. Meanwhile, Hampton Inn & Suites Santa Monica, which will be located directly across the street from the Courtyard Marriott, will have 146 rooms. Its lobby will have curved, edge-lit ceiling planes also by Illuminate. Terrazzo flooring with recycled content will be used to allow the subtle color gradations to reflect the layering effects of water. There will be a series of carved stone surfboards and local historic surf photos. There will also be casual seating groups and hammock chairs that will be suspended from the ceiling next to rope light fixtures, alongside a woven wall of ship rope that will add visual texture to the lobby. Similar to the Courtyard Marriott, the elevator lobby walls will have graphic art silkscreened onto glass, featuring geometric patterns that will culminate in an oversized image of a swimmer donning a bathing cap with three-dimensional water drop patterns surrounding lights in the ceiling above. A deck on the second floor will have bespoke furniture, a 20-foot fire pit, communal sofa and pool-length neon art depicting a series of swimmers moving across the space. The guestrooms will have an accent wall of wood wall coverings at the desk area, art pieces placed on a shelf above the upholstered headboard, and custom lighting. Wood and glass sliding doors into the bath area will allow natural light and greater maneuvering space. Bathrooms will have a white palette accented by a mosaic tile wall. Top floor suites in the hotel will have kitchenettes, living areas and balconies with outdoor seating and views of Santa Monica.